The stock of Exile Resources Inc. (CVE:ERI), (PINK:EILRF) continues to regain back the ground it had lost since the beginning of 2011. 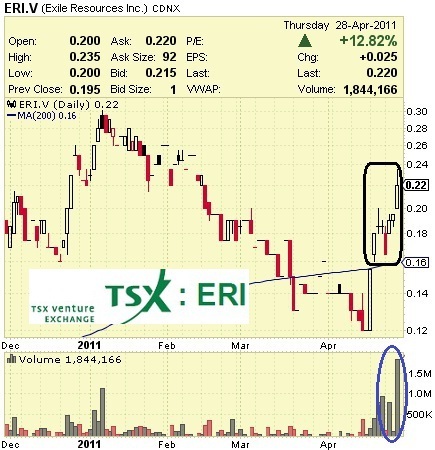 The advance started just after ERI had touched the bottom in mid-April, when it had fallen to a 6-month low at $0.12. Yesterday, the progress was further supported by the announcement of a very important development at one of the company's properties in Turkey. Within ten days, the shares jumped by 83.3% on the Canadian market to close the last session at $0.22. This is not such a bad achievement for the not very liquid stock that has a 30-day average trading volume of just 148K shares. For comparison, yesterday's turnover was 12.5 times larger than this figure and came in support of the 12.8% share rise. The advance that began in the middle of the month was additionally reinforced by the Thursday press release of the company. Exile was glad to inform the public it had spud its first exploration well in Eastern Turkey. Of course, the good news helped the stock continue its climb on the TSX Venture Exchange. For how long? Not clear. There is no guarantee that ERI will go up in the coming days to form a lasting uptrend. In fact, quite the opposite might happen too. The stock dilution is huge too - within 6 months the number of outstanding shares has grown from 63M in August to 93M in February, or by 46%. On the other side of the medal, there are positive factors that could aid the shares' performance too. In the end of February, Exile reported $4M in cash and about the same amount of working capital. Exile Resources is focused on the acquisition, exploration and development of crude oil and natural gas properties in existing and underdeveloped basins in Sub Saharan Africa, Nigeria and Turkey.